As an avid sports fan I’m always looking for ways to optimize my sports viewing experience, and over the years I have adopted High Definition television, statistics, analysis integrated into broadcasts and tweeting with fellow Yankee fans during the games. 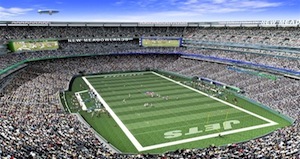 What I experienced at the New Meadowlands Stadium while watching the Jets take on the Patriots has just taken the experience full circle. It was always my goal to get out from in front of the television into the stadium but Fanvision let’s you take your living room to the stadium. 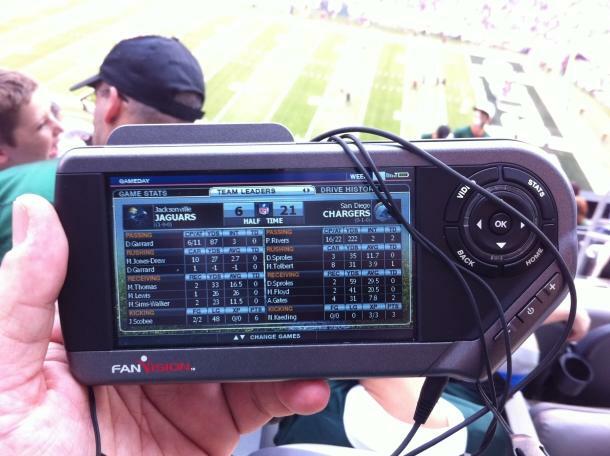 FanVision is a small portable device with a 4.3-inch screen available this year in 12 NFL stadiums, and gives fans the best of both worlds: The feel of being at the stadium with the screaming crowd along with the ability to watch the broadcast, including replays and highlights from other relevant games all from the palm of your hand. FanVision is UHF powered and receives broadcast signals directly form the stadium broadcast itself and not a cellular connection. Now if you have ever tried to use you cell phone while in a stadium of up to 90,000 fans you know the pain of actually receiving or transmitting data in such a crowd. With a six-hour battery life it’s possible to be watching other games while in the parking lot tailgating or catching the postgame interviews while making your way out of the stadium to your car. This unit is by no means pocketable but does come with a lanyard, which, although a bit geeky looking, does give you quick access to the unit for checking replays while the action has been suspended. This comes in particularly handy during those television timeouts that tend to go unnoticed at home with trips to the restroom and fridge, but are nothing more than annoying when actually at the game. This year, FanVision is being given away to upper tier season ticket holders in some stadiums, but in most, the unit will be sold to season ticket holders for $199. For the price you are purchasing the FanVision unit itself as well as access to all of this years games in your stadium. The NFL has yet to work out the details on pricing for subsequent years but all indications are that service will be sold on a per game basis. I must admit although I rolled my eyes at the prospectus of watching the game on a little television while attending the game, implementing the FanVision was extremely enjoyable. The benefits of replay and up to five different camera angles, along with audio, simply enhanced the NFL experience. The most enjoyable part of implementing FanVision was checking out the highlights and other games during the television timeouts. I’m not sure if this will catch on throughout the NFL or we will ever see 30,000 fans with little televisions in every stadium, but I personally thought it was cool to implement the tradition of attending the game with high tech gadgets.